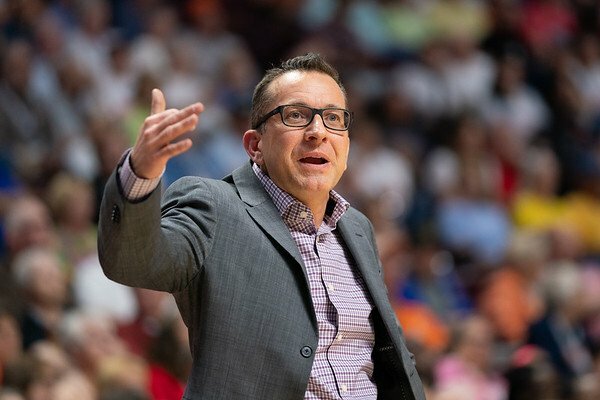 Home Features What happened to the Connecticut Sun? The Connecticut Sun began the season 7-1, and since then have had a rocky year. Chris Poss Photos. 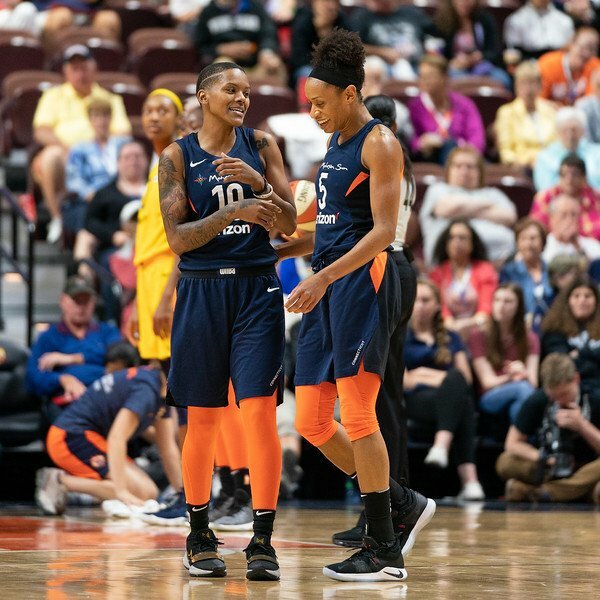 As the WNBA readies for the end-of-season finale that follows the All-Star break, a team that at first seemed a Championship contender now sits poised to be knocked out of the playoffs. What happened to the Connecticut Sun this season? They grabbed everyone’s attention early by winning seven of their first eight games – some by sizeable margins. They looked like the team that won 19 of their last 21 match ups in 2017, and finished a solid fourth place. 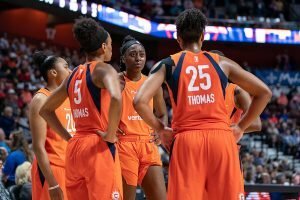 Connecticut routed Chicago, 110-72, the first day of June and looked similarly dominant in most of their other games. 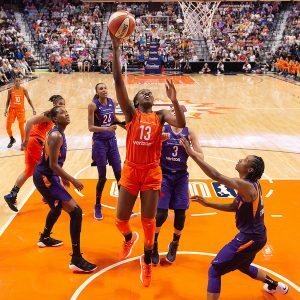 They were touted as the team to beat, due largely to the re-addition of All-Star Chiney Ogwumike, who sat out last year rehabbing an injury. Their 7-1 record put them solidly in first place. Then the bottom fell out of their season. From June 13 to July 11, the Sun dropped nine of 12 games and slid all the way to eighth place, where they sit now. 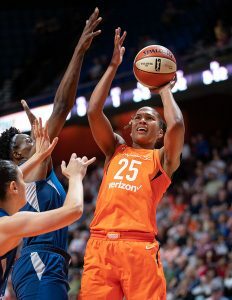 With the surge of the Las Vegas Aces, who have won four of their six games this month, Connecticut’s playoff hopes are now in jeopardy. The Sun’s slide can be hung on several factors that all converged at once. Alyssa Thomas takes a difficult shot. Chris Poss Photos. 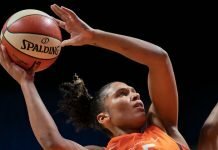 Alyssa Thomas injured: Any team will suffer on the court when their best player goes down, but Thomas is more than her statistics. A 6-2 power forward, she leads the team in assists and rebounds per game played. She often brings the ball up court like a guard, and is Connecticut’s best on-ball defender. Opponents can’t displace her once she establishes position. 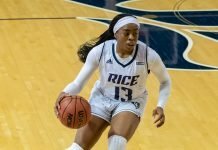 Most importantly, the team’s offense was designed to run through “AT,” as she’s known (to differentiate her from Jasmine Thomas, the starting point guard). Thomas injured her shoulder during their first loss and missed 10 games. Both as an offensive catalyst and the defensive glue of the team, her absence was obvious immediately. In a year that isn’t compacted by the World Championships in the fall, as this season is, a coach as effective as Curt Miller could restructure his system to work around the hole left by Thomas. But unfortunately, the team had almost no practice time for the next month due to a long road trip, and the team did not adjust well. Thomas returned to the lineup last week in a game Connecticut lost on a buzzer-beater to the New York Liberty. But they beat Los Angeles in a close game and blew out Minnesota, both on the road. Back at home, the team failed to convert on what should have been the last possession of a game Tuesday against Atlanta, but left 1.6 seconds on the clock. That was enough for Tiffany Hayes to launch a half-court three that dropped in at the buzzer. 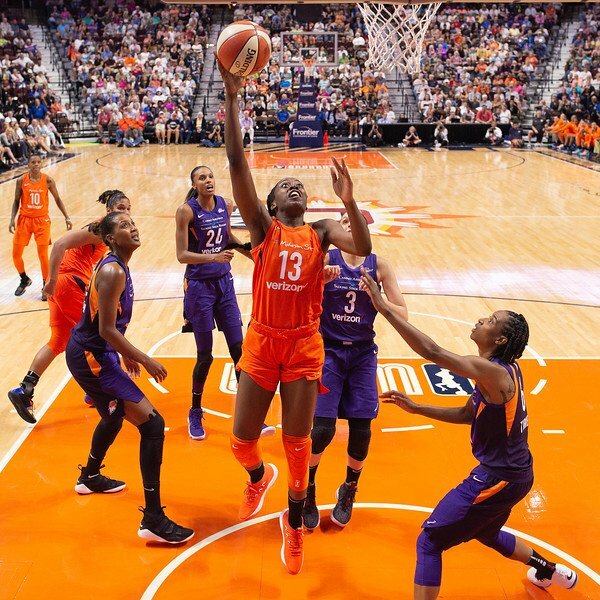 Chiney Ogwumike lays it up and in. Chris Poss Photos. An endless road trip: In the 22 days after their hot start, the Sun played nine of their next 10 games on the road. That stretch included back-to-back days in Seattle and Phoenix, 1,107 miles apart. In 10 travel days, they had only one practice. Adjustments to compensate for Thomas’ absence were next-to-impossible during this time, and the team was tired for much of the trip. Thus, the losses piled up. Internal strife: In the midst of the losing run, Connecticut announced that starting shooting guard Courtney Williams was away from the team “for personal reasons,” and she missed four games. Eventually it was revealed that Williams and guard Alex Bentley had a physical altercation. Losing their most dynamic one-on-one shooter simply added to the team’s struggles. Bentley was traded to the Dream last week for Layshia Clarendon. Jonquel Jones prepares to go up against the defense for a bucket. Chris Poss Photos. 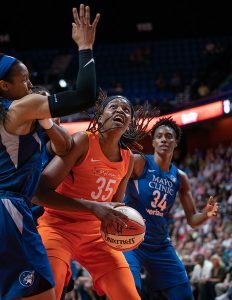 The disappearance of center Jonquel Jones: The 6-6 center was the league’s Most Improved Player last year, averaging 15.4 points and a league-record 11.9 rebounds per game in 28 minutes per contest. This season Ogwumike has returned to start in the five spot, and Jones’ production has faded, even though she still logs 20 minutes per game. On a per-minute basis, her 19.9 average should yield 10.7 points and 8.3 boards per game at last year’s rates. Instead, she has nine points and just five rebounds per outing. The problem appears to be deeper than coming off the bench or reduced playing time. For much of the season Jones has avoided the paint, preferring to take lots of three-pointers. In 23 games she has taken more shots from beyond the arc than she did in 34 contests last year, and is hitting them five percentage points below last year’s rate. Jones is a good three-point shooter, but Miller said “we don’t need a 6-6 shooting guard,” during the long losing streak. He is right. Jones is not helping the team if she is not in the paint. It is easy to think that last year was a fluke for Jones, as her 2018 numbers are worse than her rookie season on a per-minute basis. But perhaps it just has to do with youth. She reported late to the team this year, missing the entire preseason. 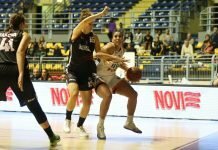 Unlike many in the league, however, she was not playing overseas. It was eventually revealed that she was home in the Bahamas for “personal reasons” not connected with immigration issues. Perhaps she is too young to realize that professional athletes make sacrifices for their teams, and that she needed to be there during practices, and for on and off-court activities before the season began. She has only sporadically seemed to mesh with her teammates on the court (although she is popular in the locker room), and has fallen in love with those threes, which take her out of rebounding range. Curt Miller directs players from the sidelines. Chris Poss Photos. Too much structure? Miller was the 2017 Coach of the Year for his remarkable turn-around of a Sun team that had been living in the league basement and out of the playoffs for several years prior to his arrival. By his second season he had built the team into playoff contenders. A first-round loss in the WNBA’s new one-game playoff format did not diminish that accomplishment. One reason that he could revive moribund Connecticut in just two years was that he is a very hands-on game coach, according to Ogwumike, who is also an ESPN analyst. But could that be a problem? Perhaps his professional athletes have unconsciously become too dependent on set plays, which has diminished their creativity in tight spots. In two buzzer-beater losses in the last fortnight, the Sun have had the ball with the shot clock off and the score tied. Miller has called a play in both cases, but the opponent has shut down the main options. Both times, Connecticut turned the ball over in apparent confusion about what to do next. And both times, miracle heaves with under two seconds remaining have done the young team in. Of course, every WNBA coach has had to deal with this year’s shortened schedule, which has stolen most of their accustomed practice time. Miller’s success with his squad can, in part, be ascribed to his ability to mold them into an effective team in practice. He has not had that luxury this season, and his players do not seem to have mastered the ability to improvise out of broken plays. Perhaps they need to be given a little more room to use the skills they all have developed after lifetimes in the game. Courtney Williams and Jasmine Thomas confer during a game pause. Chris Poss Photos. His most dynamic players are in the post, and sitting any of those three has to be hard. Perhaps with a few practice days, he can find the formula for playing big. The Sun are 12-11 and in eighth place in the league, the final playoff spot. They are just 2-2 since Thomas’ return (both losses, admittedly, on buzzer-beater heaves). Eleven games remain, and the four teams currently above them have just 13 wins, so all are within range. Connecticut beat both Los Angeles and Minnesota in the last week. One caveat is in order, however. Thomas appeared to injure her right shoulder again diving for a loose ball in Tuesday’s loss. The team has made no announcement about her status yet. Eight of the Sun’s remaining games are at home, where they are 6-3, with the losses by a total of 10 points. They have no more back-to-back games, and even have a few spots to get in some practice. They finished strong last season, and perhaps Miller can find that magic again. With some practice time, things could look up for his team. The playoffs are likely. But getting to the top two position seems much less so, which means dealing with that one-game playoff format again. Connecticut hosts the first-place Seattle Storm Friday.